May 23, 2017 – Osborne, Kan. – Finding the most efficient method of feeding pigs has been a never ending quest for producers and equipment suppliers alike. Hand feeding and automatic, gravity-flow feeders dominated the industry until the development of mechanical-flow feeding in the 1980s. This development revolutionized the industry and the only mechanically-operated feeder, the Osborne Big Wheel® Feeder, quickly became the #1 selling hog feeder in the U.S. However, as the industry moved toward wean-to-finish, producers often found no commercially-available feeding systems were adequate in a wean-to-finish environment. The best gravity-flow feeders worked well for newly weaned pigs, but as pigs grew, play waste and overloading of the trough became a maintenance nightmare. Alternatively, mechanical-flow feeders provided never-before-seen feed savings, but sometimes required assistance to help pigs get started on the feeder. Now, Osborne Industries, Inc., the industry-leading innovator in pig feeding, is pleased to announce its latest advancement in their signature line of “no-waste” pig feeders. The new FAST Start™ wean-to-finish feeder features all the no-waste, feed saving aspects of the Big Wheel family of mechanical-flow feeders, but operates in gravity-flow mode for newly weaned pigs. The feeder then automatically converts to mechanical-flow as pigs grow. Osborne’s new feeder will be introduced at the World Pork Expo, June 7-9, 2017, in Des Moines, Iowa, USA, at booth V451. When weaned pigs are put on the feeder, small slides in the feed hopper bottom are open, allowing feed to freely flow into the trough. As pigs grow, they begin turning the multi-spoke feed wheel in the bottom of the trough, which closes the slides on the feed hopper bottom. 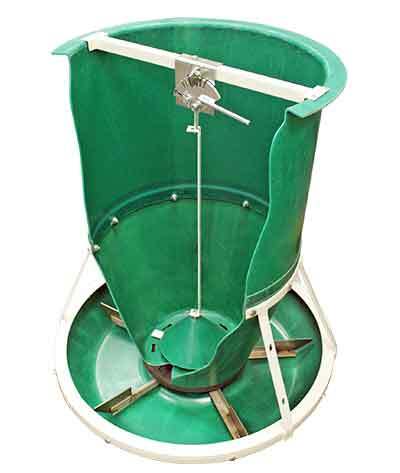 A feed sweep, located in the bottom of the feed hopper and attached to the feed wheel, sweeps feed past the cone and out of the hopper to the trough. Feed falls through the center hole into the trough, where the feed wheel dispenses it to the pigs. Feed stops flowing when pigs stop moving the wheel, allowing for the automatic conversion from gravity to mechanical flow. Made of abrasion and corrosion-resistant RTM-molded plastic, a material Osborne developed and perfected over the past 30 years, the feeder operates with minimal maintenance for years. No other round feeder compares to the quality of the Big Wheel Feeders. Osborne Big Wheel Feeders, manufactured and assembled in Osborne, Kansas, USA, are distributed worldwide. See Osborne’s new FAST Start wean-to-finish feeder at booth V451 at the World Pork Expo in Des Moines, Iowa, June 7-9, 2017. For more information, contact Osborne Industries, Inc., at 1-800-255-0316 (1-785-346-2192), e-mail info@osborne-ind.com, or visit www.osbornelivestockequipment.com.